After the Windows Movie Maker was officially discontinued on January 10, 2017, the built-in video editing capabilities of the Windows 10 OS were reduced to zero. 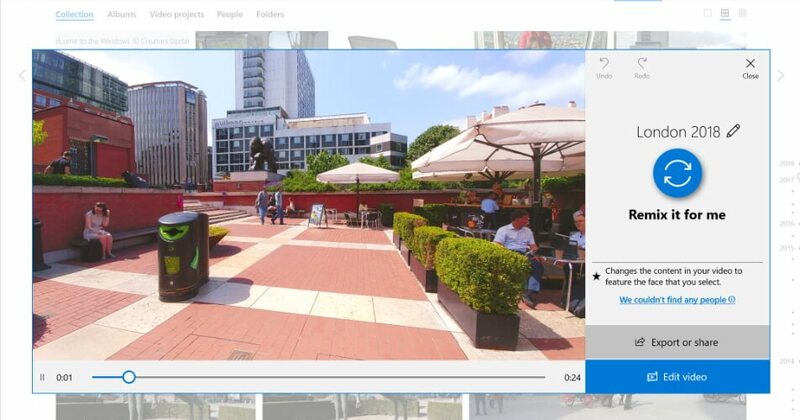 The Windows 10 Fall Update changed that by introducing video editing tools to the Photos app. Even though the video editing features are now available on Windows 10, PC owners shouldn’t get their hopes too high as the available tools offer support for a limited amount of video editing tasks. 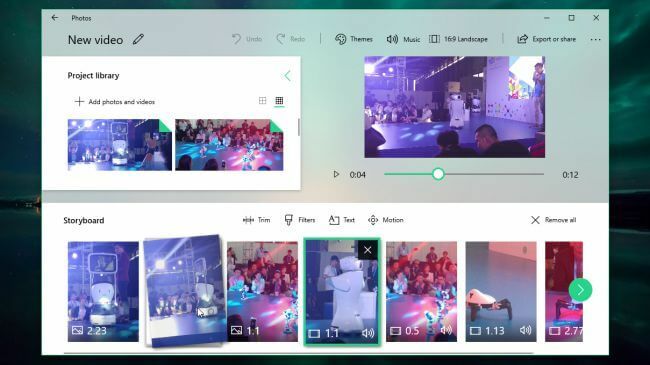 If you’re looking for a way to quickly produce a captivating video on Windows 10 without having to download a 3rd party app, you’ve come to the right place, because in this article we are going to show you how you can edit videos with the Photos app. How to Create Videos with Story Remix Feature in Photos App? The Story Remix feature lets you have fun with your footage, as it arranges your photos and videos randomly and adds music automatically. 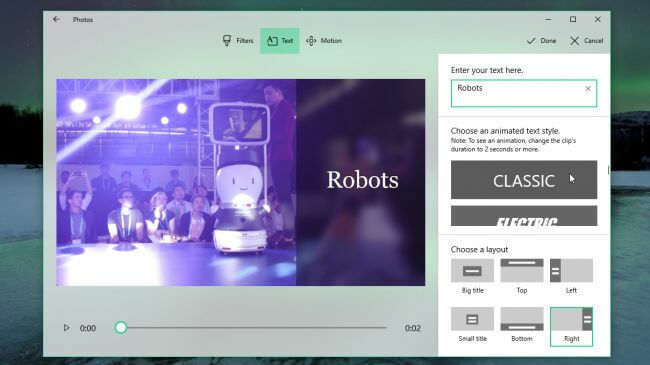 In order to select the materials for your next Story Remix, you have to click on the Create button and select the Automatic Video With Music option. Proceed to choose the folder that contains video clips or pictures you’d like your Story Remix to feature and insert the title. The new video will be generated automatically and it will start playing after a short while. Hit the Blur Remix button above "Remix It For Me" if you don’t like the results to try another random combination of video and music. Click on the Export and Share button to complete the process of making a Story Remix or hit the Edit Video button if you want to make further adjustments to the footage. Quick Fix: Why Can’t I see the Story Remix Feature? The video editing tools in the Photos app only available on Fall Creator Update, and later versions of Windows 10. If you can’t see the video editing options in the Create menu, you must update the OS you have on your PC. Furthermore, in order to use the Photos app, your computer must meet the software’s minimum technical requirements. You should have Windows 10 version 15063.0 or higher installed and the architecture should be either ARM X64 or X86. If you still can’t access the Story Remix feature, even though you’ve updated the OS, maybe you should try using other 3rd party video editing software on your Windows10 computer. There is nothing complicated about editing videos in the Photos app since you can quickly make the adjustments to the footage and export the file in no time. Here are the steps you’ll need to take in order to edit a video on Windows 10. After you launch the Photos app, you should click on the Import button to add the files you want to edit to the software. You can choose between ‘From a Folder’ or ‘From a USB’ options and once you select the folder you want to import just click on the ‘Add This Folder to Pictures’ button. Unfortunately, you can’t add files to the app separately, since you must specify the folder you’d like to import. That’s why it is a good idea to place all videos and images you want to include in your video in a single folder and import them at the same time. All files you add to the folder after you imported to the software will automatically be added to your project. Click on the Create button and choose the ‘Custom Video With Music’ option after you’ve imported the images and videos to the software. 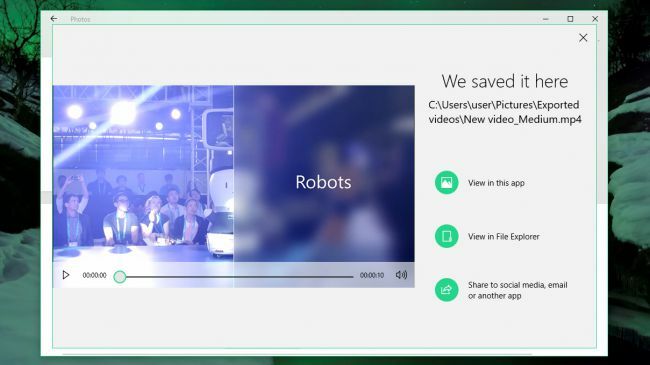 The Photos app will automatically generate a video you can preview in the top right corner of the window. The video and audio tracks are going to be synced, but if you don’t like the results you can easily change the position of each video clip by simply dragging it to a new location in the Storyboard that is located at bottom of the screen. If you would like to remove parts of a video clip, you simply have to select it in the Storyboard section and click on the Trim icon. You can then set the new start and end points of that clip by dragging the markers. Hit Done and proceed to preview the results by clicking on the Play button located below the Preview window. To access to the app’s text features, you first have to select a clip in the Storyboard and then click on the Text icon. In the top right corner of the window you’ll be able to see the ’Enter your text here’ box, so you can just type in the text you want to add to the clip you selected. As you type the text will be automatically resized to fit the available space on the screen. If the clip lasts longer than two seconds the text will be animated, and you can choose the style of animation from the menu on the right side of the screen. Click on one of the options in the ‘Choose a Layout’ section to reposition the text and hit the Done button to confirm the changes. The menu above the Storyboard offers the Motion feature that enables you to add Pan and Zoom effects to your footage. The option works better with still images, but you can also try it out on the videos if you want to add some extra movement to a shot. The options available in the Themes menu will give your video a distinctive look as well as add some music and titles to it. However, using a particular theme means that the duration of the clips will be changed so they can be synced with the music. This can alter the way you originally arranged the clips, so make sure that you like the adjustments you’ve made before hitting the Done button. The Photos app offers a wide range of photo and video filters that can be used to enhance the colors in your videos. Most of the filters have a vintage look, but unfortunately, you can’t fine-tune their properties. Click on the Filters icon after selecting a clip in the Storyboard and browse through the software’s collection of presets. When you find a filter you like, simply click on it to select it, and then click on the Done button to apply it to the selected clip. Clicking on the 3D Effects icon will grant you the access to the app’s rich selection of 3D effects that can help you highlight an important point in your video. Unlike filters, the 3D effects are fully customizable, so you can choose how much of the effect is applied to the video. Use the green slider in the Preview Window to set the start and end points for the effect and click on the Arrow icon to fine-tune the direction and angle of the effect. 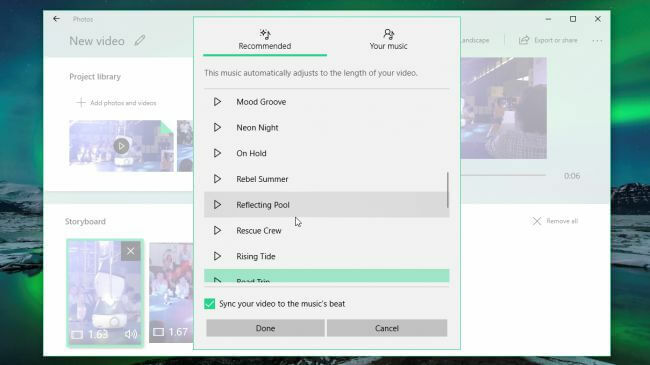 A soundtrack for your video will be automatically generated immediately after you start editing the footage, but if you don’t like the song you can replace it by another track featured in the Photos app’s music library or you can import a song from your hard drive. The original sound of a clip can at times be too loud or too quiet, but you can just right-click on a clip in the Storyboard and select the Volume option to adjust its volume level. Click on the Export and Share button located in the top menu, if there is nothing else you’d like to change in your video. After clicking this button you’ll be asked to choose from Small, Medium and Large video sizes. Even though you can select the image quality, you can’t change the frame rate or the resolution of a video manually, since these are determined automatically. 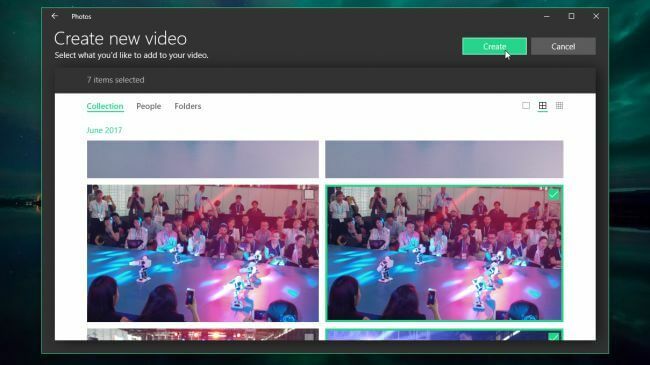 After the rendering process is completed, your video will be exported to the Pictures folder and you can click on the Share option in the Photos app if you want to post the video YouTube or send it to a friend on Skype. Even if you have no previous video editing experience what so ever, you can create captivating videos on Windows 10. 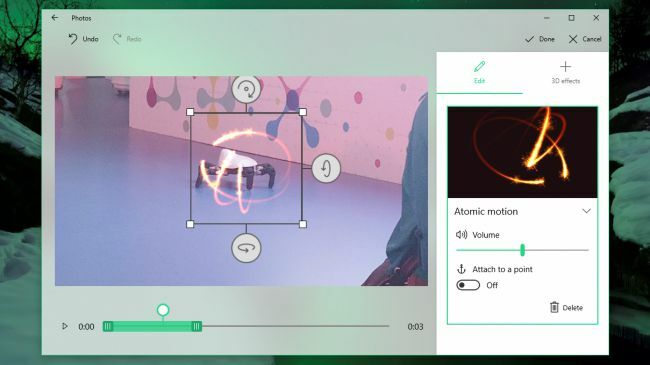 The video editing tools offered by the Photos app let you polish your footage quickly, but if you would like to have more control over the filters or video effects you apply to your videos, you should try using a 3rd party video editor that lets you manipulate media files in any way you want. I recommend you to try Wondershare Filmora video editor. It is listed as one of the best video editing software for beginners by many websites, such as toptenreviews.com. This video editing software can be used on Windows 7/8/10 and Mac as well. It has intuitive interface so users can edit and create video within a few minutes. You can check the video tutorial below to find out how to create and edit videos with Filmora. Don't forget to download it and have a try. Enjoy.